If you have an 80s themed event, you need to promote it with an equally "80’s styled" poster. This tutorial will help you accomplish just that. All you have to do is to follow these instructions and you will learn how to add the right effects and filters for that convincingly 80’s kind of style. 1. Of course, you will want to first setup your document correctly for poster printing. 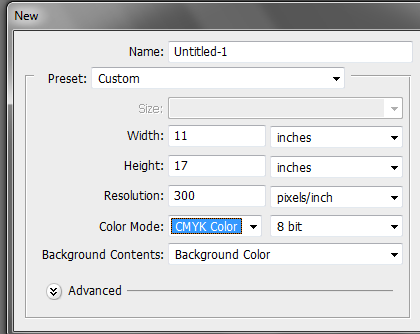 Once you open a new document in Adobe Photoshop, set your height and width according to typical poster dimensions. Also make sure that you use a fairly high resolution value for the document so that it fits printing specifications correctly. A 300ppi value is appropriate for this. 2. Next, we will setup the background. For the main background, use the paint bucket tool to color it with a nice faded orange color (#F4A07E). 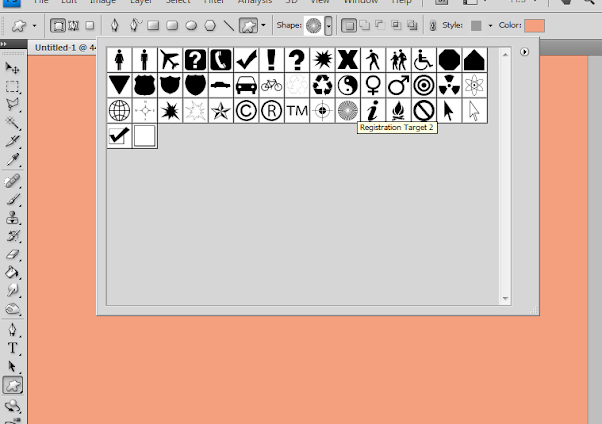 Then go to the custom Shape tool and select for the "Registration Target 2" symbol. 3. Now, put in the custom shape into your canvass. Color this shape with a darker color based on your background (or with the color theme that you like). Make sure to try and center the shape into the canvass. Also, make it bigger so that the round circle portions of the shape are not visible. For smaller media like brochures or booklets, make sure you adjust the size of the object as you don’t want your design to be mostly the round center instead of mostly the sun rays. 4. Once you are satisfied with the position of the shape. 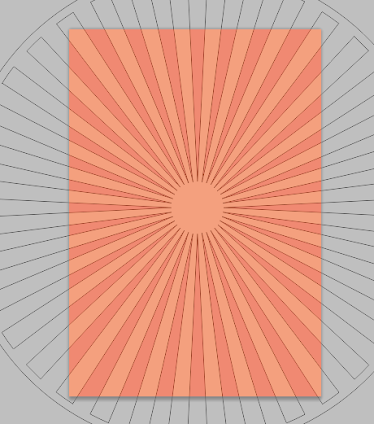 Duplicate the background layer and then merge that duplicate background with this shape on top. Then, double click on this new merged layer and apply a Gradient Overlay layer style. Use the values below for the gradient overlay settings. 5. Great! Now we will add more noise to our design. Create a new layer on top of our merged layer before. Set your foreground color to a grey and the background color to black. Then go to Filter -> Render -> Clouds. Clouds should appear on your document. 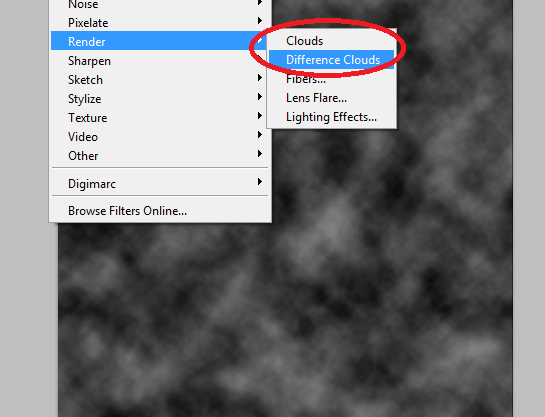 Afterwards, go to Filter -> Render -> Difference Clouds, to make the clouds have more definition. 6. Now, we add more filters. First go to Filter -> Artistic -> Film Grain… Use these values for the settings. 7. Next, go to Filter -> Sharpen -> Unsharp Mask… Use these values for its settings. 9. Next, go to Image -> Adjustments -> Levels. Change the input levels to 15, 1.00 and 110 respectively. 10. Once done, change the blend mode of this layer to "Screen". Adjust its opacity to around 50-60%. 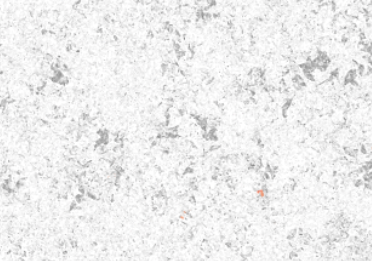 You will now notice that our design has some white splotches and a grainy quality that makes it look grunge. 11. Now, create a new layer, and fill it with black. Then use the elliptical marquee tool to remove the center like so. 12. Now, change the blend mode of this black layer to "Linear Burn". Reduce its fill opacity to 20%. Finally go to Filter -> Blur -> Gaussian Blur and set a radius of 150 pixels. This gives us a darker fuzzy border in the design. 13. We shall make our background "dirtier" still. Create another layer above the layer we have been working with. Change your foreground color to white, and the background color to black. Then go to the Brush to the brushes panel (F5) and choose the "Maple Leaf" brush. Click on "Color Dynamics" and set Foreground/Background Jitter to 100%. You will want to paint the whole layer with this brush with a large size of 250px. 14. Then, paint the whole layer with this brush again. This time though, change its mode to "Difference". 15. Next, apply the Film Grain filter again here like the other background. Go to Filter -> Artistic -> Film Grain… Use these values. 16. Next filter is the Fresco filter again. Go to Filter -> Artistic -> Fresco. 17. Finally, apply two effects. First go to Filter -> Stylize -> Solarize. Second go to Image -> Adjustments -> Invert. This will give you this final effect. 18. Change the blend mode of this layer to "Linear Burn" and then reduce its opacity to 30% to add this extra noisy/dirt layer to our background. 19. Now it is time to insert our main feature image. This can be anything that you have chosen for your theme of course. 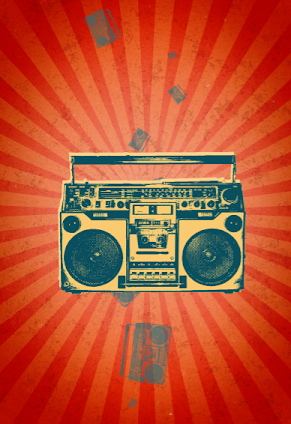 For our 80’s themed poster though, we have chosen an 80’s "boombox" cassette player. We got this from a nice share in flickr here (http://www.flickr.com/photos/stopbits/5384684136/sizes/l/in/photostream/). 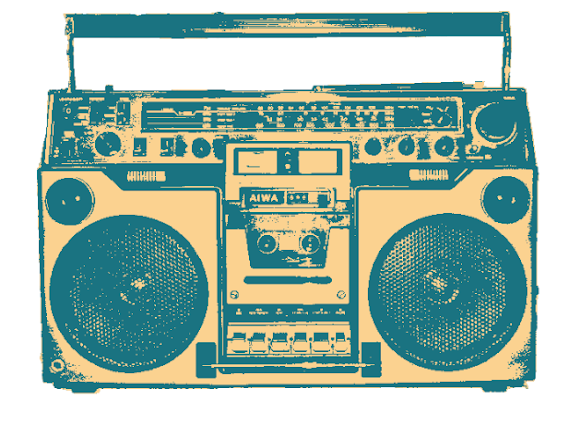 We processed using the magnetic lasso tool, eliminating the background and just getting the boombox. 20. Take note that we have not pasted this cut out image yet to our poster design. We will apply some special effects here to make it more appropriate for our poster. First go to Layer -> New Adjustment Layer -> Threshold. Adjust the threshold level until you get something like the picture below. Take note that this all depends on how your image is rendered. 21. Next, click on the image layer itself. Go to Filter -> Sharpen -> Unsharp Mask… Use a 500% amount, a radius of 15 pixels and threshold levels of 5. 22. Now, with the right look set, merge the adjustment layer and the actual image layer to finalize the style that we need for this design feature. 23. 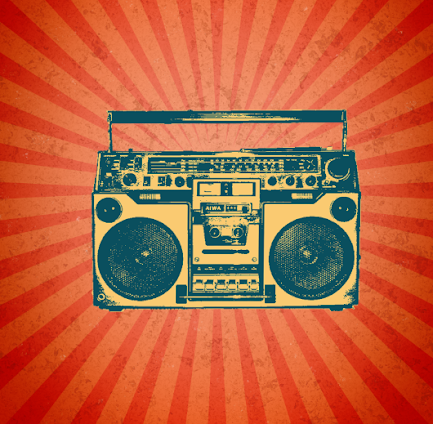 Good, now we will alter the colors of this boombox a bit. Hold down the CTRL key and click on the picture thumbnail of our newly merged layer. Then create a new layer on top and fill it with an appropriate theme color. 24. Then, select the original image layer again. Then press CTRL+C. Go to the channels panel and create a new channel. Paste in our selection by pressing CTRL+V into the new channel. 25. 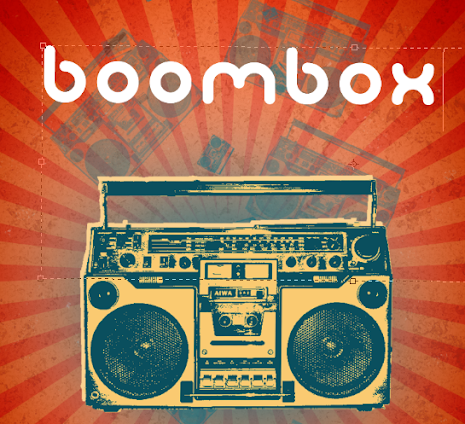 With this channel we are able to select all the white areas of the boombox. Hold down the CTRL key on the keyboard and click on the Alpha1 channel to make the selection. 26. Then, go to the layers panel. Create a new layer and then fill the selection with an appropriate lighter colored theme color (we used #FBD290). Then merge all your three layers that we processed to get a nice colored result. 27. Then we paste in this layer to our design. Press CTRL+T to resize and reorient the main image as needed. 28. 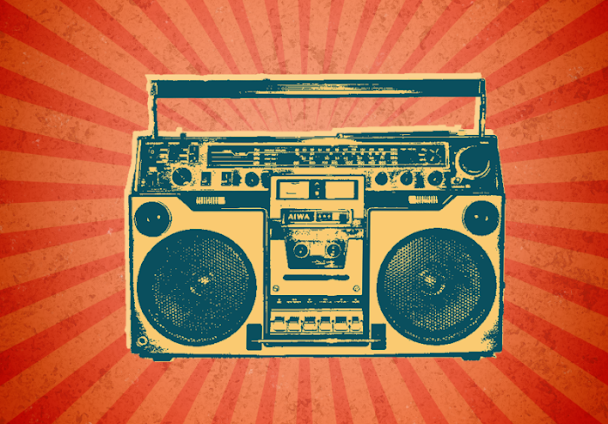 To add an accent to our boombox, create a new layer. 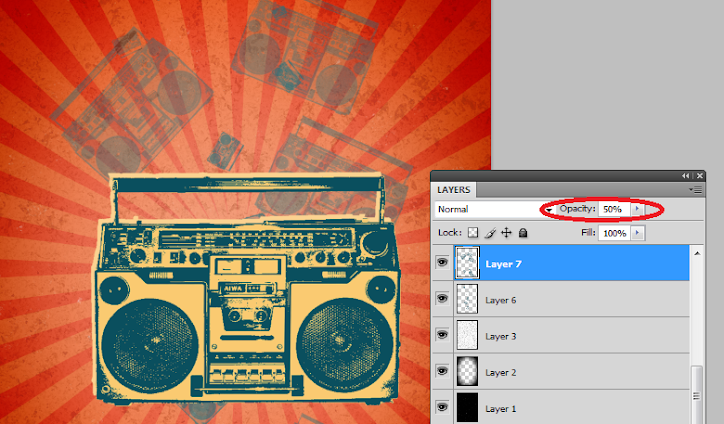 Then select the area of the boombox by holding down the CTRL key and clicking on the layer’s thumbnail. Fill up the selection with the lighter color we used for this image. Then send this layer to the back of the boombox. Nudge this layer using the arrow keys a few pixels to the right (3-5 nudges) and a few pixels upward (3-5 nudges as well). 29. 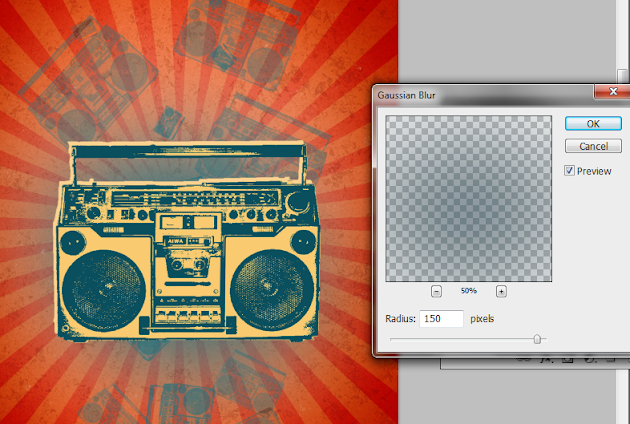 Now, we will create a brush out of our boombox image. Select the layer of the boombox. Then go to Edit -> Define Brush Preset… Name it as you want to. 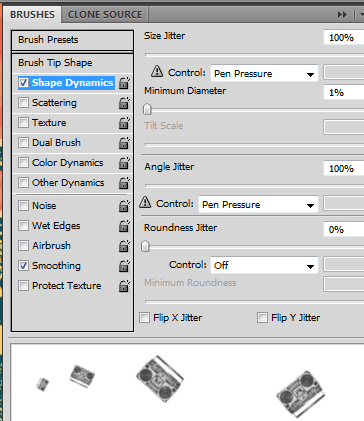 Then go to the Brush panel and select the new brush preset. Click on the Brush Tip Shape option and set the spacing value to 370%. 30. Afterwards, click on Shape Dynamics. Set the size jitter to 100% and the Angle jitter to 100% as well. 31. Finally, create a new layer on top of the background. Then set your foreground color to the darker color of your theme (ours was #1a7381). Paint using our new brush from top to bottom causing some of our image brushes to appear. 32. Do it again, this time create a new layer, use a larger sized brush and then reduce the opacity of this layer to around 50%. 33. 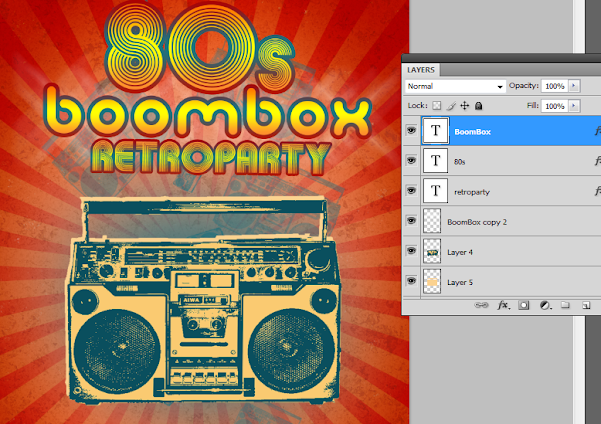 Next, using the elliptical shape tool, we will create a shadow effect for our boombox. Simply create an ellipse directly behind the stroke and boombox layer. Then, go to Filters -> Blur -> Gaussian Blur. Adjust the values as needed, but a high of 100-150 or more is good to accent this as a soft shadow. 34. Now, it is about time to add in your text title for the poster. Using an appropriately retro font, type in your title using the type tool. Use a lighter theme color here to make it more visible against the background. Create 2 extra copies of this text layer by pressing CTRL+J two times. 35. Then, select one of the duplicate layers. Go to Filter -> Blur -> Motion blur. Use a -45 degree angle and a 400 pixel distance. 36. Do the same for the other copy, this time adjust the angle to positive 45 degrees. Then merge both motion blurred layers and reduce their opacity to around 70%. 37. Then, double click on our text layer. 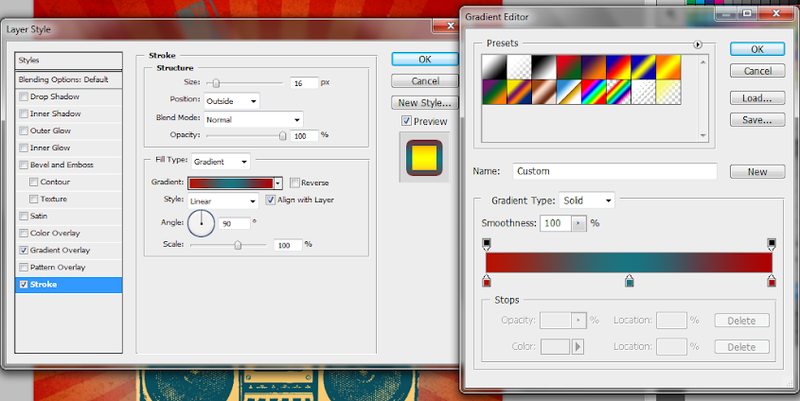 On the layer styles window that opens, click on "Gradient Overlay". Choose an orange yellow orange gradient. 38. Also, click on the Stroke option. Use A gradient stroke use colors darker than the text of course. Increase the size to around 15px. 39. Do the same for all the other text for your title. Then try to shift their orientation a bit. You can do this by pressing CTRl+T and then just rotating the text in the angle that you want. Of course change the font style for your other text as necessary to get a good creative effect. 40. Then, just add the details of the event in a smaller font at the bottom. Again use lighter colors that will contrast with the background. 41. Wonderful! 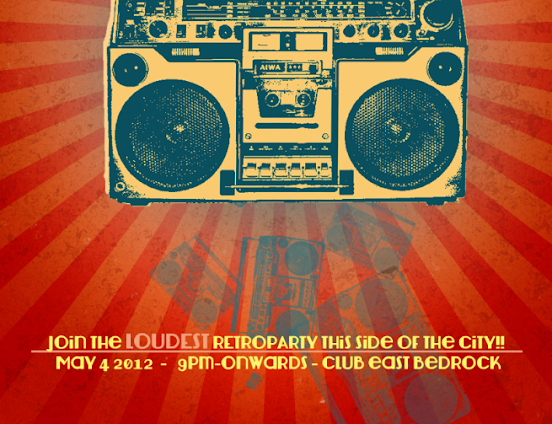 Now you know how to design a cool 80’s retro poster design for special themed events.